Castile soap and shampoo bars are two popular alternatives to shampoo. People often report that the two are gentler and do not strip hair. Is this really true? Q1: How does soap work? Castile soap and shampoo bars are both soaps. I guess there is an expectation that soap works differently from shampoo but it does not. Soap and shampoo clean with the same principle. They both contain surfactants which can dissolve oil (I will link the surfactant article only once today lol...here it is). In actual fact very similar to SLS, soaps are anionic (meaning negatively charged) surfactants. Q2: Are soaps milder than shampoo? Not necessarily (Journal of the American Academy of Dermatology, pp 35-41, 1979). Irritation of the skin is based on removal of oil from the skin. The oil layer removal causes dryness and itching. The more effective the soap or shampoo is at removing oil, the more irritation it will cause. Q3: Is soap an effective cleanser? Yes soap is an effective cleanser with a proviso. Soap works best with soft water. Hard water contains minerals such as calcium which react with the soap. This creates what we know as soap scum which is quite difficult to get rid of. As long as you have soft water, soap is an effective cleanser. Q3: What about the fact that soap is alkaline? 1. Is there scientific evidence that pH can raise or close cuticles? 2. Is there scientific evidence that pH can cause relaxing of hair? 3. Is there scientifc evidence that pH can irreversibly damage skin or hair? 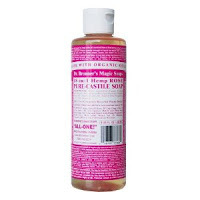 What about castile soap's effects on silicones? Can castile soap remove silicones from the hair? Thanks for the post Jc! Would soap be ok to use with a shower filter? I have some black soap that I've been using for my face and body, but not my hair. Honestly, I don't want to use soap on my hair, but I'm curious...are standard shower filters REMOVING mineral deposits from the water or just REDUCING them? Slight pun intended with "reducing"....yay chemistry, haha! Looking forward to tomorrow's post; should be interesting. When I tested the black soap shampoo I made from raw African black soap, the pH was 7 (neutral). Ohh can't wait 4 2moros answers! muahahahahaha. Im not alone! I'm also looking forward to this post. I have been using castile soap on and off for the last year (other times I use ACV), but after watching Kimmaytube's video on the pH of castile soap decided to return to my ACV rinse. Oh good to know about the black soap calla lily! I see you have got to grips with the pH strips now! To make your shampoo did you just dissolve the soap or did you add a few other ingredients like glycerin? Jc: Will you be doing research into African Black Soap? I'll soon be making some shampoo out of it and I'd like to know some of the science behind it. Thanks! CallaLliy: Did you follow a recipe for the African black Soap Shampoo? I'm looking for one to based my mixture off of. Also, do you pre-poo before you use it? If so, how'd did your hair feel afterward? Hi Efe: I do share a recipe for shampoo on my blog but I don't go by that one. I'm sure you can google a recipe also. I make mine in small batches (only use 4 other ingredients beside the soap and water) and just eyeball it instead of measuring. Lately, I've been lazy but most times I like to pre-poo with an oil overnight. The shampoo makes my hair feel clean and moisturized. I can actually do a good job of finger detangling each section I wash so by the time I put conditioner in my hair, the job is a whole lot easier. I have stopped using other shampoos. From CallaLily - Hello Jc: I am revisiting this post to apologetically retract my earlier comment reading the pH of African Black Soap Shampoo. Another wonderful, natural blogger informed me that her pH reading was higher than what I stated. In my defense, my first purchase of pH strips was from a company named Majestic Mountain Sage. You can purchase 100 strips for $2 USD. I did get a reading of 7 using those strips to test my homemade shampoo (which consisted of African Black Soap, water, aloe vera juice, vegetable glycerin, jojoba oil and olive oil). After hearing about her discovery, I decided to purchase the pH strips sold by Luv Naturals for $15 USD. When I received my order and tested my shampoo, I did indeed get a higher reading. Although aloe vera juice has a pH of around 4, I don’t know how much of it would need to be used to dilute the black soap shampoo for a more hair-friendly pH.